Announcing the 9th Annual Lexington Ave Arts and Fun Festival ~ Downtown Asheville ~ Sunday, Sept 5th, Free! Join us in the annual FREE end-of-summer celebration of Asheville’s artistic and musical communities, The Lexington Ave Arts and Fun Festival. LAAFF is entering our 9th year of filling three blocks of N. Lexington Ave in downtown with all local art, food, beer, music, street performers, and random acts of creativity. LAAFF takes place on Sunday, September 5th, 2010. LAAFF has become the showcase event for all types of talent on multiple stages and performance areas including rock and roll, indie pop, funk, folk, reggae, world beats, singer-songwriters, bluegrass, old time, African drummers, clowns, magicians, contortionists, belly dancers, modern dancers, vaudeville actors, break dancers, hula hoopers, and more. LAAFF has grown over the years to become known as Asheville’s largest independent street festival with upwards of 15,000 in attendance. LAAFF is an experience the whole family can get into. Kids will love making art, dancing, getting their faces painted and having fun all day long. Kids are also in on the act showing off their breakdancing, parading, and making music. The big “kids” will enjoy the ever popular bicycle jousting, local brews provided by the Asheville Brewers Alliance, an eclectic culinary and artistic experience, as well as the new big people game: Big Wheels for Big Kids. There will be lots of fun new vendors as well as old favorites with a ton of variety. Created specifically for LAAFF by Co-Founder Michael Mooney, LAAFF’s ever popular Bicycle Jousting is always a mainstay attraction! This is a fun and safe bike joust where contestants are armored up with foam and helmets. The sit upon bike with banana seats and wheel with elliptical hubs which make the bike bounce up and down like riding on a horse. Each contestant holds a long pole with a boxing glove on the end..If they can reach each other they try and joust the other off the bike. It is extremely fun to watch and a great activity that Michael created as an event at LAAFF. To see the gear in advance go to Pack Place’s Front Gallery… will you dare to ride? LaZoom Tour Bus hosts a rolling LAAFF theatre for the day! If you just want to enjoy an easy going ride… LaZoom has traveling sideshows with a variety of acts (Including kids acts and adult only acts) throughout the day in 40 minute loops around Asheville. This is set up as an affordable way to fund-raise at LAAFF with extra entertainment to the festival. Various arts schools and organizations have in the past teamed up to create the LAAFF Kids area. There is always face painting and a chill out zone for parents with babies who may need to sit down and relax, breastfeed, or change a diaper. As part of an ongoing commitment to improve and expand the role of the Lexington Avenue Arts Festival in the community, greening efforts and more emphasis on environmental issues will continue to increase. The core principle of being an all local event has been a foundation of the festival’s efforts to support local artists, musicians, restaurants, and non-profits. For instance, using water sales as a way for local non-profits to raise funds and involving the Asheville On Bikes organization to host a bike corral, encouraging participants in the festival to ride bikes, use public transportation, and carpool to limit their impact. Reducing waste has always been an important goal, and last year composting was added to the recycling and reuse efforts. Many of the food and beverage vendors are now using compostable cups and utensils. The festival will continue to include local non-profits, especially environmental and arts organizations and hopefully will showcase renewable energy in LAAFF’s to come. For more info email greening@lexfestasheville.com. LAAFF also has a great merchandise area with LAAFF T-shirts, water bottles, and performer merchandise. 100% of performer merch proceeds goes back to the bands themselves. There is also a silent auction to raise fund for Arts 2 People of which some donated items are available to see on our “silent auction” page of this website. We accepting items up through the morning of the festival each year. Email vending@lexfestasheville.com if you would like to donate or be a vendor at the event. LAAFF relies on community support to ensure our success each year. LAAFF is a volunteer driven event, with a core staff, put on by and for the community. Your tax-deductible contribution ensures the ongoing successes of this much anticipated yearly Asheville celebration. LAAFF is a project of 501(c)3 non-profit Arts 2 People. To get involved email director@lexfestasheville.com for info on how to plug in. For publicity inquiries please email dreamspider@gmail.com. T he 20th annual GrassRoots Festival of Music and Dance starts today in Trumansburg, NY!!! There has been a ton of talk about this years fest; here are a few excerpts and links to the full articles. Enjoy! …The seeds for GrassRoots were sewn more than 20 years ago, when the band Donna the Buffalo invited two other Tompkins County acts to get together and perform a benefit concert to support the fight against AIDS. Gathering at The State Theatre, The Horse Flies and Johnny Dowd’s Neon Baptist performed a show that had both a social and a musical component. …“It was fueled by the AIDS crisis at first,” Jeb Puryear noted. “But soon, it became a focal point for positive energy for tons of people around. At the end of the day, the significance of a festival relies not on the caliber of its headliner but by the quality of its constituents. It is the milieu, not the marquee that makes a gathering memorable; community rather than celebrity. Try to conjure up a mental image of Woodstock: for the most part the focus would surely center on the crowd and not the stage. …A considered mix of the global and the local, the festival elucidates connections between zydeco and reggae, hippies and Touregs. At GrassRoots, all music is dance music, and it’s dance music from every nook and cranny of American culture. Dropping by Trumansburg this week answers the question not only what the next American music will sound like, but what community can feel like. Grassroots was founded in 1991 by Jeb Puryear – the songwriter, vocalist and guitarist for the host band, Donna the Buffalo – along with a large circle of his fellow musicians, friends and family that has since become its own self-sustaining non-profit organization supported by hundreds of volunteers. In terms of attendance, Grassroots has slowly grown to approximately 10 times its original size: About 1,500 people attended the inaugural edition, and a total of 15,000 came through the gates last year, according to the festival office. …Puryear sees no end in sight for Grassroots, which has the feel of a family reunion sometimes, he says. Donna the Buffalo’s Tara Nevins has a new album in the works at Levon Helm Studios. The album is being produced by Larry Campbell who will also be performing on the album. The new album will be put out through Sugar Hill Records. Multi-instrumentalist, Larry Campbell is the Producer of two Grammy winning albums with Levon Helm: Dirt Farmer and it’s followup album Electric Dirt. Campbell also toured with Bob Dylan for eight years. Since Larry’s departure from Bob Dylan’s band, he has continued to make guest appearances with various artists including Elvis Costello, Emmylou Harris and Rosanne Cash. He presently tours regularly with Levon Helm and Phil Lesh and hosts Midnight Rambles several times a month at his studio in Woodstock, NY. In 2008, Larry was awarded a Lifetime Achievement Award for his instrumental work from the Americana Music Association. As one of the Donna the Buffalo‘s primary singers and songwriters, Tara Nevins is known for rich, mellow singing voice and socially conscious songwriting blended with her acoustic guitar, accordion, and fiddle playing. 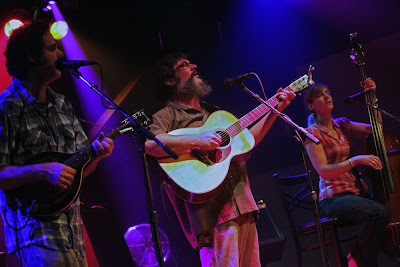 Nevins has become renowned in folk-rock circles across the country. To begin to understand Tara’s passion for music, one must first look to the Old-time musical community where Tara has spent over 20 years playing the fiddle. She is a regular at the Mt Airy fiddlers’ convention where she has been known to play upwards of 27 hours of fiddle tunes in 3 days time! 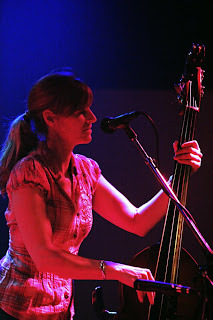 Beyond her time with DTB, Tara has also spent years playing with the all-female Cajun/Old-time band, The Heartbeats. In 1999 Tara debuted her solo album, Mule to Ride. Her love of Zydeco is equally as influential. While evident in her accordion playing, she has also expressed her love of Louisiana culture by producing a documentary on the late Carlton Frank (Preston’s Frank uncle) in 2005. Nevins expanded her repertoire even furthur when In the summer of 2009 she went on the road with the Grateful Dead drummer Bill Kreutzmann’s BK3. This year also marks the 20th year anniversary of the Finger Lakes GrassRoots Festival of Music and Dance in Trumansburg, NY; which DtB’s started towards the beginning of the band’s inception and are still the driving force behind. 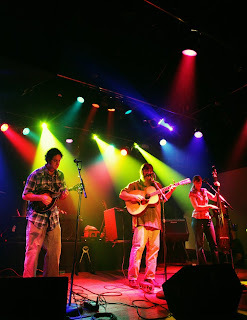 Check out this fantastic Larry Keel and Natural Bridge live show review by Rex Thompson with Music Marauders. I have posted excerpts and a couple of the image from the full review below. Please do click on any of the images or links below to read the full review and see all the great pics! …Keel is considered, and rightly so in my eyes, one of the finest flatpicking guitarists alive. The Style, begun sometime in the early twentieth century, has the guitar pick held firmly between two or three fingers, and uses a wider, flatter tipped pick. The crowd filed in and pushed up front, ready for something special, and boy howdy, were they in luck. The trio of Larry and Jenny Keel, and mandolinist Mark Schimick took the stage, and after a few last minute tunings, launched into the stratosphere of Bluegrass, calling out Bill Monroe and the Watson boys, and giving the legends their due. The frantic pace he was keeping had its toll on more than just his health. The tunings of instruments is a fine one, and when playing Bluegrass, a skill you get to practice regularly, as the crazed strumming can play havoc on strings and their tightness. Taking a moment to correct his sound his wife Jenny quipped “It was in tune when ya bought it!” The beatings bluegrass instruments take is astounding. But it’s not all arms flailing as they strum away. There were moments of awesome focus and considerable concentration, as Keel would stand stock still, eyes squozen shut, totally lost to the outside world. The world could have ended right there and then I a ball of fire, and while there was still muscle tissue left on his fingers, Larry Keel would have been picking out those runs, tearing up and down the neck of his guitar like some sort of machine, built to tear up and down the neck of a guitar! But, like John Henry before him, he would burn out the motor of any mechanical device paired against him! His wife Jenny imparts a deepness, a richness of undertone to all these pickings. A weight, a sense of surety that keeps the high flying guitar notes from reaching to high, establishing a bottom end to Larry and Mark’s soaring highs! Speaking of the mandolin player, Mark, and accompanists in general, it seems that the Keels are not just some of the nicest people in the biz, they are musically very easy to work with. From Keller Williams to Yonder Mountain to whoever is lucky enough to have him be in the area! I have seen Schimick strum his mandolin next to Larry, but this was a special session it seemed. The blend between the two was special, and echoed to an extent later in the Rumpke Mountain set. Maybe it was something in the air, or in my ear, but the collaborations between the two were epic. Twice, Jenny left the stage so the boys could “Pick on one” for us and twice it was magic. A fun Peter Tosh cover thrown in for good measure, and then Larry attempted a local remedy for his illness. Strengthened by the snake oil, Larry invited the Rumpke Boys up to join him for some picking and grinning. A once round the circle jam became a twice round the circle jam and Larry grew as animate as I saw him that night. Buoyed by the energy of his now full stage of pickers and grinners, he seemed to fill into his full form and wowed all who were there with his skills. The smiles on the faces of those onstage matched the smiles of those in the crowd, and the hoedown that was the first set ended on an uproarious note! … And so I say with all the passion I can muster go see Larry Keel pick ya a number, go hear the Rumpke fellers funk up some of the all time greats. You have my word you’ll be glad you did! Galen Kipar Projects new release the Scenic Route is well received!